Whether you’re perfecting your double backflip at the park, capturing a flash mob on your phone, or enjoying singing in a subway, it’s not easy to get your video quality perfect. Sometimes videos suffer from symptoms like “shaky-camera-itis” or “augmented-darkness-levels” that keep viewers from seeing just how awesome your video really is. We made a big step last year with the YouTube Video Editor, and now we’re adding a feature that does the work of curing these symptoms for you. 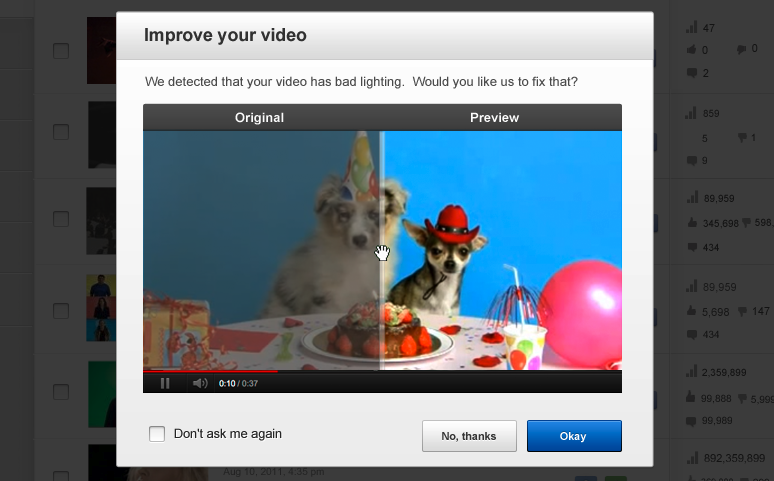 If you upload a video that’s shaky or dark, we’ll automatically offer to fix it for you, creating an updated version of your video on YouTube. When you upload a video that could use a fixup, you’ll see a notification bar on the Upload page and in your Video Manager. Click the button to fix it, and you’ll see a side by side preview to decide if you want to accept the edits. This breakthrough in video awesomeness is possible thanks to our research team who expanded on the “I’m Feeling Lucky” button launched last year, automatically detecting if stabilization or color correction would be helpful for you. The result is a one-click option rolling out over the next few days that cures these two symptoms now, and more planned in the future. So you keep capturing those awesome moments, and we’ll keep on developing ways to help you make those videos even more awesome.